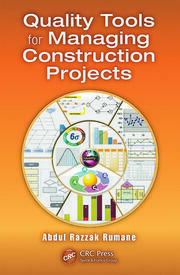 The book is developed to provide significant information and guidelines to construction and project management professionals (owners, designers, consultants, construction managers, project managers, supervisors, contractors, builders, developers, and many others from the construction-related industry) involved in construction projects (mainly civil construction projects, commercial-A/E projects) and construction-related industries. It covers the importance of construction management principles, procedures, concepts, methods, and tools, and their applications to various activities/components/subsystems of different phases of the life cycle of a construction project. These applications will improve the construction process in order to conveniently manage the project and make the project most qualitative, competitive, and economical. It also discuss the interaction and/or combination among some of the activities/elements of management functions, management processes, and their effective implementation and applications that are essential throughout the life cycle of project to conveniently manage the project. The construction project life cycle phases and its activities/elements/subsystems are comprehensively developed and take into consideration Henri Fayol's Management Function concept which was subsequently modified by Koontz and O'Donnel and Management Processes Knowledge Areas described in PMBOK® published by Project Management Institute (PMI). 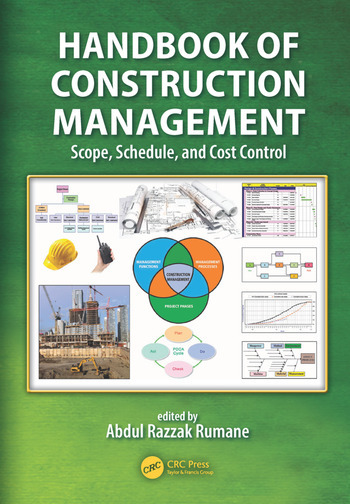 The information available in the book will also prove valuable for academics/instructors to provide construction management/project management students with in-depth knowledge and guidelines followed in the construction projects and familiarize them with construction management practices. Overview of Construction Projects. Construction Projects. Construction Project Life Cycle. Principles of Quality in Construction Project. Project Delivery Systems. Organization for Construction Management. Qualification of Construction Manager. Types of Construction Manager. Role of Construction Manager. Design Development. Bidding and Tendering. Construction. Testing, Commissioning, and Handover. Construction Management. Scope Control. Time Control. Cost Control.Communication. Risk Management. Contract Management. Health, Safety, and Environment Management. Tools for Construction Management. Standards. Contract Laws. 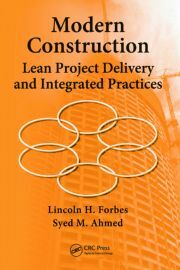 Lean Construction. Bibliography. Abdul Razzak Rumane PhD is a Registered Senior Consultant with The Chartered Quality Institute (UK) and a certified consultant engineer in electrical engineering. He obtained a Bachelor of Engineering (Electrical) degree from the Marathwada University (now Dr. Babasaheb Ambedkar Marathwada University), India, in 1972, and received his PhD from the Kennedy Western University (now Warren National University) in 2005. His dissertation topic was “Quality Engineering Applications in Construction Projects.” Dr. Rumane’s professional career exceeds 40 years, including 10 years in manufacturing industries and about 30 years in construction projects. Presently he is associated with SIJJEEL Co., Kuwait, as an Advisor and Director, Construction Management. Dr. Rumane is associated with a number of professional organizations. He is a Chartered Quality Professional-Fellow of The Chartered Quality Institute (UK), Fellow of The Institution of Engineers (India), and has an Honorary Fellowship of Chartered Management Association (Hong Kong). He is also a Senior Member of Institute of Electrical and Electronics Engineers (the United States), a Senior Member of American Society for Quality, a Member of Kuwait Society of Engineers, a Member of SAVE International (The Value Society), Member of the Project Management Institute. He is also an Associate Member of American Society of Civil Engineers, a Member of London Diplomatic Academy, Member of International Diplomatic Academy, and a Member Board of Governors of International Benevolent Research Forum. As an accomplished engineer, Dr. Rumane has been awarded an honorary doctorate in engineering from The Yorker International University. World Quality Congress awarded him the “Global Award for Excellence in Quality Management and Leadership.” The Albert Schweitzer International Foundation honored him with a gold medal for “outstanding contribution in the field of Construction Quality Management” and “outstanding contribution in the field of electrical engineering/consultancy in construction projects in Kuwait.” European Academy of Informatization honored him with the “World Order of Science-Education-Culture” and a title of “Cavalier,” and The Sovereign Order of the Knights of Justice, England honored him with a Meritorious Service Medal. He was selected as one of the top 100 engineers in 2009 of IBC (International Biographical Centre, Cambridge, U.K.). He was also honorary chairman of The Institution of Engineers (India), Kuwait chapter, for the years 2013–2014 and 2005–2007. Dr. Rumane is an author of books titled “Quality Management in Construction Projects” and “Quality Tools for Managing Construction Projects” both published by the CRC Press (A Taylor & Francis Group Company), the United States.